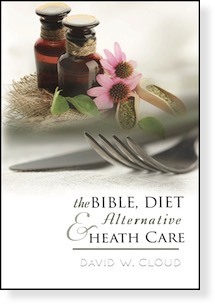 Previously titled: "The Bible and Diet" this new edition has been updated, enlarged, and re-titled. Our intention with this book is not to tell God’s people what to eat; it is to help them think biblically about diet. The book begins with an extensive study of the Bible’s teaching on the subject of diet by examining 31 passages of Scripture. It answers questions such as the following: Was Adam’s diet a perfect diet? Is eating meat unhealthy? Were the restrictions against unclean animals in Leviticus for the purpose of health? Was Daniel a vegetarian? Did Daniel fast for health? Was Jesus a vegetarian? Is the New Testament believer under obligation to keep Old Testament diets? What place should exercise have in the Christian’s life? Is there an advantage to taking vitamins and supplements? The book warns about quack diets, describing 14 marks of quackery, including bogus science, unsubstantiated testimonials, heretical interpretations of the Bible. and the tendency to become an “evangelist” for one’s chosen type of quackery. It also warns about the occultic influence that has crept into the dietary field through “alternative health” practices. We help the reader understand when alternative health care is wrong, looking in particular at Reiki, Ayurveda, homeopathy, reflexology, iridology, acupuncture, hypnosis, meditation, chiropractic, macrobiotics, naturopathy, rolfing, applied kinesiology, neuro-emotional techniques, Touch for Health, and behavioral kinesiology. We examine popular arguments about alternative health care such as the following: It is merely the wise use of natural healing properties; you can “eat the fish and spit out the bones”; it can’t hurt; it is God’s will that we be healthy; the body is capable of healing itself; the Bible lays out the ideal healthy diet; and if it is natural it must be good. We believe that diet is largely a personal matter. If you like your diet and you believe that it helps you, or if you need a certain diet for a special health situation, that is your business. If you want to take B12 supplements or Barley Green or megadoses of vitamin C and if you want to juice or eat uncooked food or drink some special type of water or avoid gluten, that is your business. But we would urge you not to fall for something that is patently unscriptural or that is based on bogus “science” or that flirts with the New Age and Eastern religion.